The last thing designer Seth Aaron Henderson wants you to do is take him or his work too literally. The Season 7 Project Runway winner may be unveiling a runway line that pays homage to solar technology, but don't expect him to go slap-happy with photovoltaic panels and a glue gun. Set to debut at Portland Fashion Week in October—Henderson's first show since his television win in spring—the 15-piece collection features designs inspired by the event's sponsor, SolarWorld, which will in turn be unfurling a runway composed of its new reflective black panels. The audience will get a visual interpretation of photovoltaic panels, not a “literal replication,” Henderson says. When Henderson debuts his line at Portland Fashion Week in October, what the audience will get is a visual interpretation of photovoltaic panels, not a “literal replication,” he says. In keeping with the event’s theme, “Solar is the New Black,” the catwalk will be paved with SolarWorld’s new, sleek, high-performance solar panels. Henderson will be joined by fellow Project Runway alumni Jonathan Peters and Jay Sario, all of whom will be presenting their first collections since their television appearances. 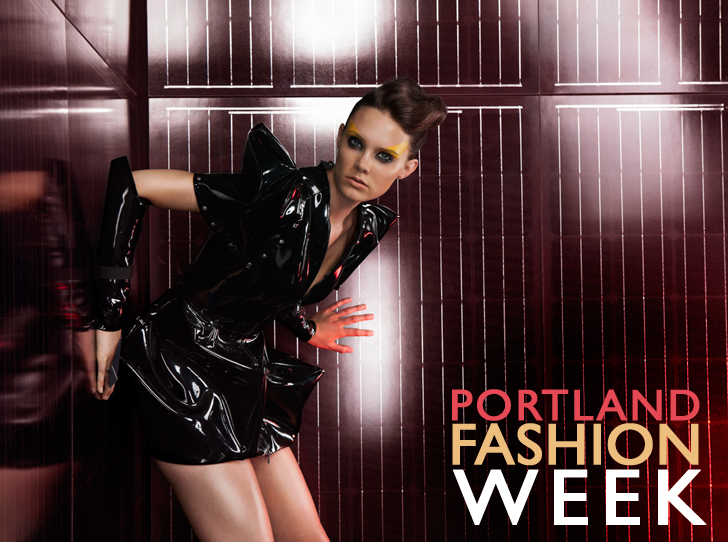 Ecouterre is proud to be an official media sponsor of Portland Fashion Week. The ex-PR peeps out there are getting to be way too many. The show is really getting to the bottom of the barrel when this pseudo-fashion starts to rear it's ugly head really, really stretching to get something, anything into an Eco-fashion show. This is not fashion, sorry folks. I agree with Spena. This isn't fashion, it's a sponsorship. The only thing smart about this collection is Seth Aaron's understanding that he needs to cash in on his fleeting famous moments while he can. So, good for him for making a living, but anyone who waits with bated breath for any trends to come out of this sponsorship deal will most likely pass out. Brilliant interpretation of fashion. Seth Aaron continues to get high marks in New York for his creativity, style, and forward-thinking edge. Applause, applause! Nah, I don't think so. This show has been a dog for several years running and Seth Aaron must be getting desperate already if he has to latch on this. I think 'notfooled' hit it right. Time is ticking for Aaron very quickly. The San Diego native is quick to note that his pieces will be a visual interpretation of solar technology, not actual high-tech wearables. "You're going to get the spirit of it," he tells Ecouterre. "I'm not going to be taking square boxes and putting them on people." What Henderson, SolarWorld, and Portland Fashion Week hope to achieve, is a cross-pollination between the seemingly disparate realms of fashion and solar technology. By marrying clean, renewable energy and couture, their statement is simple: fashion can be sustainable and sustainability can be fashionable. In fact, the theme of Portland Fashion Week this season is "'Solar Is the New Black." And when the stilettos hit the sleek, polished surface on October 9, the runway show will be the nation's first carbon-neutral fashion affair, with a litany of sustainable, fair-trade, and independent designers who will be strutting their ensembles down the catwalk. Although Henderson is still putting the final touches on his collection—"I won't be done till the day before the show," he says. "I work till the last minute. "—he offered a sneak peek of one of the looks, an angular, high-gloss take on the epidermis-hugging little black dress. The look, says Henderson, captures his first impression of the SolarWorld factory floor in Hillsboro Ore., a vista of polished metal, immutable edges, and exacting grids. "This will be a fun mix of fantasy and 'wearability,' hardness and softness," he says of his ensembles. 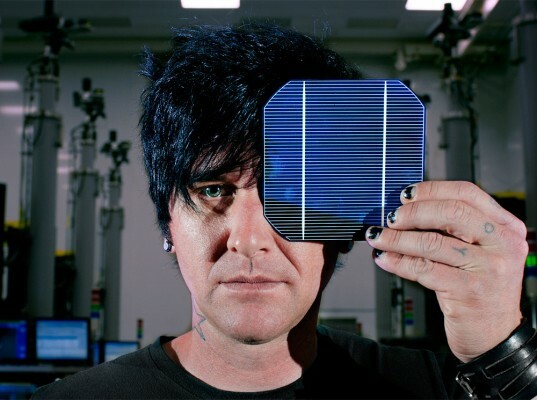 "It’s an artistic story about solar power and renewable energy. But, as it should be, it's a fashion story, a fashion collection." And what would Michael, Nina, Heidi, and Tim think? "They're going to love it," Henderson says.